In higher plants, iron (Fe) is an essential element for photosynthesis and growth. Two basic helix-loop-helix (bHLH) transcription factors, bHLH104 and IAA-LEUCINE RESISTANT3 (ILR3), positively regulate Fe uptake in Arabidopsis. Furthermore, an E3 ubiquitin ligase, BRUTUS (BTS) functions as a negative regulator upstream of bHLH104 and ILR3 in the Fe homeostasis pathway. Interestingly, we characterized a lesion of BRUTUS (BTS), which exhibited pale-green leaves and retarded in growth. Genetic analyses showed that only loss of ILR3 could entirely compromise the chlorosis in bts-2 mutants. To further investigate whether bHLH104 and ILR3 have different roles in functioning downstream of BTS other than Fe absorption, we obtained bHLH104-, and ILR3-overexpressing plants. Interestingly, similar to bts-2, overexpression of ILR3 displayed chlorotic leaves. 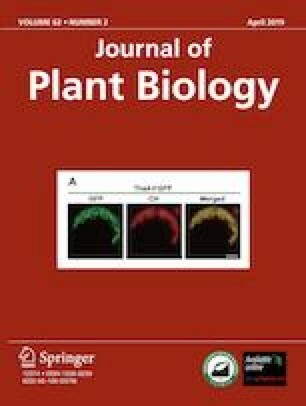 Moreover, overexpressing ILR3 also caused the abundance of thylakoid proteins reduced, along with photosynthetic genes decreased. However, there was no visible difference between bHLH104-overexpressing plants and WT. Furthermore, we found that bHLH104 and ILR3 may act independently on different downstream targets. bHLH104, but not ILR3, could bind to the promoter of At- NEET, which acts as a Fe-S/Fe cluster donor in chloroplasts. Collectively, our data demonstrate that bHLH104 and ILR3 possess different downstream targets that may have distinct effects on photosynthesis, although they share a common function in Fe deficiency responses. Supplementary material is available for this article at https://doi.org/10.1007/s12374-018-0360-8 and is accessible for authorized users. Supplementary material, approximately 397 KB.